Tokidoki's Unicorno Frenzies family is growing! 12 of their most popular Unicorno characters are now available in Frenzie form. All your favorites are here including Can Can, Lolopessa, Lily, Scooter, Cremino, Sirena, Cleo, Ruby, Margherita, Yuki, Pixie, and Cornetto. There are 12 possible characters to find, so add them to your collection for some zipper pull, keychain, clip-on fun. Blind boxed mini figure. Includes one random Unicorno Frenzies toy per box. Tokidoki's Unicorno Frenzies family is growing! 12 of their most popular Unicorno characters are now available in Frenzie form. Blind boxed mini figure. 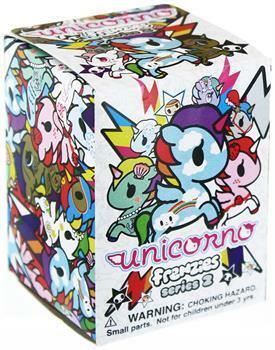 Includes one random Unicorno Frenzies toy per box. Each blind box contains one character sealed in a foil bag. Phonezie attachment included, so you can plug your new Unicorno Frenzie into any standard headphone jack! Small lobster clasp with 6 cm strap.